Amazon | A pioneering neuroscientist shows how the long-sought merger of brains with machines is about to become a paradigm-shifting reality. Imagine living in a world where people use their computers, drive their cars, and communicate with one another simply by thinking. In this stunning and inspiring work, Duke University neuroscientist Miguel Nicolelis shares his revolutionary insights into how the brain creates thought and the human sense of self — and how this might be augmented by machines, so that the entire universe will be within our reach. 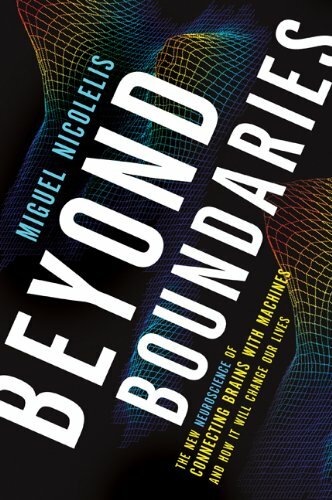 Beyond Boundaries draws on Nicolelis’s ground-breaking research with monkeys that he taught to control the movements of a robot located halfway around the globe by using brain signals alone. Nicolelis’s work with primates has uncovered a new method for capturing brain function — by recording rich neuronal symphonies rather than the activity of single neurons. His lab is now paving the way for a new treatment for Parkinson’s, silk-thin exoskeletons to grant mobility to the paralyzed, and breathtaking leaps in space exploration, global communication, manufacturing, and more.